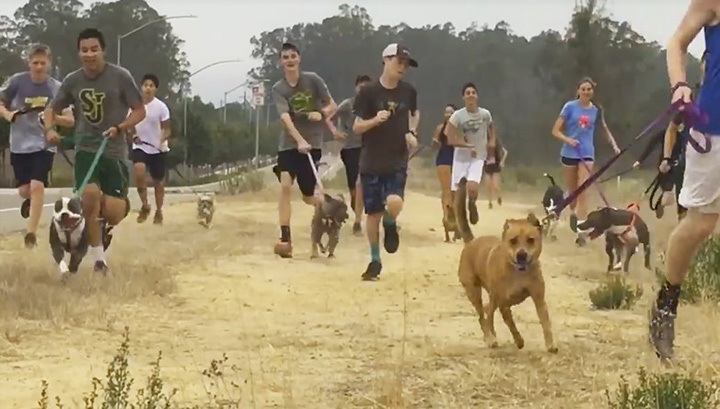 Members of the St. Joseph High School cross-country team in California invited more than a dozen shelter dogs to accompany them on their morning run this week. Each teammate was paired with a dog from the Santa Barbara County Animal Shelter before heading out for a long run as one big happy group. "I am not sure who was more excited and having the most fun ... the dogs or the kids," coach Luis Escobar said. "Either way, it was a great time and I am sure we will do it again sometime soon." Hopefully this becomes a regular thing, and that it inspires other schools to try it out, too!